Check out the all new 2017 Chevrolet Bolt EV. It’s an all electric vehicle that’s built for economy and fun! Bolt offers a range of over 230 miles, all without one single drop of gasoline! Bolt starts at only $29,995 (including Federal Tax deduction) and offers a 100,000 mile GM warranty. Call our Customer Care Team now at 630-898-9630 to schedule a V.I.P. demonstration drive. Or, visit our website to learn more about this fantastic electric vehicle. Make a strong decision with Silverado and Ron Westphal Chevrolet. 2017 models are going fast! Shop first for the best selection. Call Ron Westphal Chevrolet’s Customer Care Team at 630-898-9630 for the latest lease offers and more. Visit our Chevy Truck Lease Page for the most current truck, car and SUV lease offers. Hey, have you seen the all new 2018 Chevrolet Traverse yet? Check out this video featuring the 2018 Redline Edition! The 2018 Chevy Equinox is something of a rebel. First, this third-generation Equinox, offered with front- or all-wheel drive, bucks trends by shrinking — not growing — compared to the vehicle it replaces. Second, despite being Chevy’s second-best-selling nameplate in 2016 (Silverado was first), it’s willing to take styling chances. Third, it’s the first multi-engine Chevy ever to field a motor menu comprised solely of turbocharged engines — all four-cylinders. Looking for something with a modern style? The 2018 Equinox could be perfect for you! Call our Customer Care Team today and schedule a V.I.P. test drive. Or, visit us online anytime. This guy is not risk-averse. 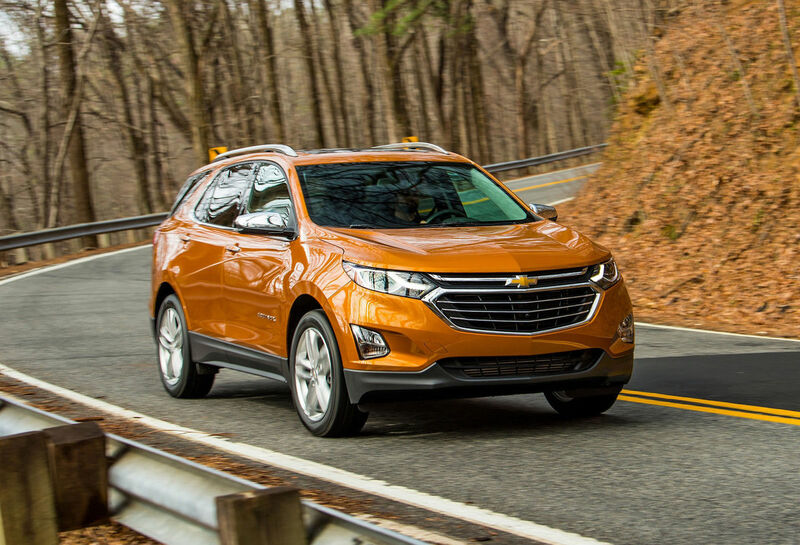 Offered in L, LS, LT and Premier trims, Equinox is available with a 1.5-liter making 170 hp; a 2.0-liter making 252 hp; and a 1.6-liter diesel good for 137 hp. The 2.0 buttons to a nine-speed automatic, the others to a six-speed. We drove a front-drive LT 2.0T. Notably smaller than Generation 2, this Gen 3 Equinox, riding a 5.2-inch shorter wheelbase, casts an overall shadow that’s 4.7 inches more compact. That, and the resulting 400-pound weight savings, allows this guy to claim EPA mpg ratings that are better than average for the class. Helping is Equinox’s standard stop/start engine feature, which — typical of GM — has no “off” button. Fortunately, it’s notably less irritating here than in many vehicles. Weight loss notwithstanding, we suspect the base engine has its hands full (we haven’t driven it), but the 2.0-liter blown four in our front-drive LT was lively. With 260 lb.-ft. of torque managed by a smooth nine-speed, we never felt deprived of power, even as our front-driver returned 24 mpg over 150 miles, more in-town than highway. From a styling standpoint, Equinox looks great. We loved the front’s Malibu-esque grille and the profile’s forward-leaning C-pillar, trailed as it is by a blacked-out D-pillar, giving the flank an in-motion look. The cargo bay aft of the (foldable) second row is small by segment standards, but people room is aces front and rear. If anything, we found the front buckets overly supportive, with a beefy horizontal shoulder bolster that, paired with the seat back’s big side bolsters, sort of gave the impression of leaning back into a catcher’s mitt. 2018 Chevrolet Equinox styling: In our LT’s quiet cabin, infotainment, including an audio volume knob, was happily simple and soft-touch buttons on the steering wheel had pleasant tactile feel. Pricing tells us Chevy is proud of the quantum leap this new Equinox has made over its predecessor. A base L front-driver starts at an accessible $24,525, but our front-drive LT, with the stronger engine and nine-speed, had a base price just over $30,000. To that we had to add a $1,945 package to get heated seats, power liftgate, dual-zone climate, Rear Park Assist and Rear Cross-Traffic, Blind Zone and Lane Change alerts. That done, our LT 2.0T was very nice, indeed, and a real competitor in a segment that includes the Ford Escape, Honda CR-V and Toyota RAV4. ll small cars in performance, execution and layout in new honors from the National Highway Traffic Safety Administration and J.D. Power. Would you like to Find New Roads in a brand new Chevrolet Cruze? Call our Customer Care Team at 630-898-9630 to schedule your V.I.P. appointment today. Or, drop by our website! In a recent special-edition company newsletter, GM Lords-town reported the NHTSA gave the Cruze a 5-Star safety rating, the best available. The NHTSA’s safety rating program evaluates how vehicles perform in crash tests involving frontal, side and roll-over testing, the types of traffic accidents most common on America’s roads. In the evaluation process, more stars mean safer cars. “This is more great news for our Cruze. The consumer information label affixed to the left rear window of Cruze will soon change from the current 4-Star to 5-Star,” said Lordstown plant manager Rick Demuynck. J.D. Power’s study for Automotive Performance, Execution and Layout released last week showed the Cruze ranked fifth in the small-car segment, up from 18th place last year, which was the second-largest APEAL improvement in the industry. The most appealing vehicles tend to remain on dealer lots for shorter periods, command higher prices, and are more likely to create brand loyalty when traded in, according to the APEAL study, which measures owners’ emotional attachment and level of excitement about 77 attributes that manufacturers use to help design and develop more appealing vehicles. The safety and design awards show the hard work and effort put forth by United Auto Workers of America and General Motors, said Robert Morales, president of UAW Local 1714, which represents fabrication workers at the plant. “I believe the awards will translate into increased sales. People do pay attention. I believe these awards and our hard work will definitely pay off,” Morales said. As a preview to our upcoming off-road head-to-head comparison test, we wanted to show you what the all-new 2017 Chevrolet Colorado ZR2 looks like, in full detail, in living color. Want your own 4X4 ZR2? Call Ron Westphal Chevrolet in Aurora, IL near Naperville at 630-898-9630. Or, visit our website today. You may also like this article: http://westphalchevyblog.com/index.php/2017/05/02/2017-chevrolet-colorado-zr2-rolls-customers-motor-trend/ Thanks for looking at our 2017 Chevrolet Colorado ZR2: Photo Gallery. The mileage king of the 2017 Chevrolet Malibu lineup is the Hybrid model, a mid-size gas/electric sedan that borrows some of its energy components from the electric Volt and Bolt. The mileage king of the 2017 Chevrolet Malibu lineup is the Hybrid model, a mid-size gas/electric sedan that borrows some of its energy components from the Volt and Bolt electric vehicles. As a result, the 2017 Malibu Hybrid will take you an amazing 49 miles down the highway on a single gallon of gasoline. Ron Westphal Chevrolet (in Aurora IL near Naperville) stocks a large selection of brand new and late-model Chevrolet Malibu models. Visit our website or call our Customer Care Team today. The Malibu Hybrid uses a 1.8-liter 4-cylinder engine and electric motors for its power. The combination results in a total of 182 horsepower and sends 277 lb.-ft. of torque to the front wheels. You won’t win red light races in this car, but if you buy one that’s probably not what you had in mind anyway. However, while the others are stopped for gas, you’ll drive right by the station with a big smile on your face. An 80-cell 1.5 kWh lithium-ion battery pack supplies power to the hybrid system and can power the Malibu Hybrid up to about 55 miles per hour on electricity alone. The gas engine automatically kicks in at higher speeds or when the driver calls for more power. One day during my week with the Malibu Hybrid, I drove from Denham Springs to the Santa Maria subdivision. The odometer showed the round trip was about 46 miles, but the “distance to empty” reading was only about five miles less at the end of the trip than the start. That’s because the car stores energy that is generated when coasting or braking. I drove the car with an eye towards fuel economy instead of my normal way, which generally does not have an eye towards fuel economy unless I’m almost out of gas. I was amazed at the fuel efficiency of this mid-sized sedan. And much of this efficiency is attributable to its sharing technology with the Volt. In addition to the drive unit, the Malibu Hybrid also share’s the 2016 Volt’s blended regenerative braking system, which provides maximum kinetic energy recovery during braking and coasting. The energy is stored in the battery for use later. On the road, the Malibu Hybrid is comfortable and roomy. Our Jet Black test car absorbed potholes without fuss, and it had the necessary power from its gas and electric motors to get around slower vehicles on two-lane roads. Inside the cabin, the 8-way power front seats were well bolstered and comfortable. There’s still some hard plastic in this car, but materials were soft in the right spots. Keyless start is standard, although it takes a little getting used to when you push the start button and only the electrical system silently boots up. The engine doesn’t come on until it’s needed. Graphics on the 7-inch diagonal touchscreen were crisp and clear, and Apple CarPlay and Android Auto are standard on the base audio system for 2017. The driver has the ability to switch between display screens, one of which is an energy meter. This function allows the driver to see what source is supplying vehicle power: the battery, the engine or both. The screen also shows when regenerative braking is active. It’s more than just a really cool feature that I enjoyed using, it’s a good tool to help drivers become more fuel efficient. A new Teen Driver feature is also standard equipment. This feature allows parents to set driving controls, review junior’s driving habits and encourage safe driving. Finally, the 2017 Chevy Malibu Hybrid is also a safe car, winning a 5-star safety rating from the government. The hybrid version of the Malibu hasn’t been rated by the Insurance Institute for Highway Safety, but the regular 2017 Malibu is a “Top Safety Pick Plus,” which is the agency’s highest rating. Thanks for reading about the 2017 Chevrolet Malibu Hybrid. We hope to see you soon. Unlike most people in developed countries, Americans often use pickups like cars. The vehicles that Europeans and Japanese choose for commuting, shuttling their children and grabbing groceries could park in the bed of the Chevrolet Silverado 2500 HD. Then again, this Chevy is more of a leviathan than most pickups. This grown-up Tonka toy and its General Motors twin, the GMC Sierra 2500 HD, are the closest many drivers will get to operating heavy machinery. Looking for your own heave machinery? Call Ron Westphal Chevrolet now at 630-898-9630 or visit our website and get your own HD Silverado. For those not overly familiar with pickups, the Ford F150s, Chevy Silverados and Rams we see most often are 1500s. These are solid trucks that carry wallboard and tow motorbikes when they aren’t doing family duty. Hauling the clan in a 2500 series is like cutting butter with a chain saw. Excess is fun — until you need finesse. Spoiler alert: This Silverado actually has some. Ford and Ram also make 2500s (3500s, too, but let’s not go there today). Pickups are all about numbers and bragging rights. 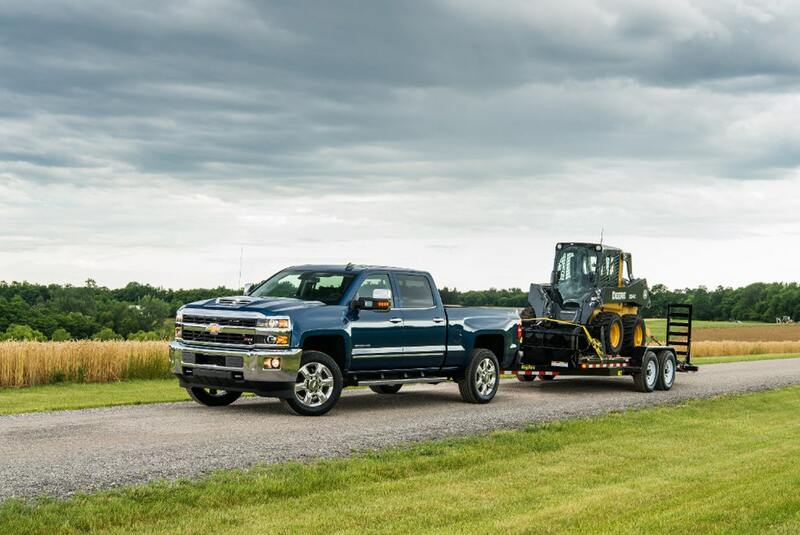 The 2500s are serious work rigs that, in the Silverado’s case, can tow up to 18,100 pounds. Its maximum payload is 3,534 pounds. That’s about 500 pounds more than the weight of a Toyota Prius. Did you know that trucks in this class are not rated by the Environmental Protection Agency? The 2500 HD I drove was equipped with the revised 6.6-liter Duramax diesel V-8. I saw 17 miles per gallon, a stellar number considering Silverado’s 7,300-pound weight. That engine, rated at 445 horsepower and a jaw-dropping 910 pound-feet of torque, is paired exclusively with a six-speed Allison transmission. The column-mounted shift lever often slides straight into “low” rather than “drive,” so pay attention. The small manual shift buttons on the arm are a bit awkward to use. Steering wheel paddles could be useful here. You can choose between rear- and four-wheel drive. There’s a towing mode, including a trailer-sway control that pulses the Silverado’s brakes to help stabilize the load. Adjustments can be made to the trailer brakes, and an engine brake setting helps save the physical brakes when lugging heavy cargo down steep mountain roads. Just like the big rigs. Can’t have the tourists taking any Snapchats with the mid-engined C8. If “Take a tour of the Chevy Corvette factory in Bowling Green” is one of the items on your summertime bucket list this year, you might want to fast-track those plans for that trip down Kentucky way. Starting this June, General Motors will be closing the Corvette factory to the public for a year and a half. Want a new Corvette now? Call our Customer Care Team at 630-898-9630 or visit us online. The National Corvette Museum’s Katie Frassinelli told the Bowling Green Daily News the tours are being shut down in order to give the facility a chance to conduct extensive changes to the factory. The Bowling Green, KY factory will offer its final tours on Friday, June 16th. While General Motors officials reportedly refused to discuss future plans during an April 28th conversation at the Corvette Museum, even a drunken monkey would be liable to draw a connection between the planned plant closure and the forthcoming mid-engined C8-generation Corvette. That future Chevy has been spied repeatedly over the last year, clad in thick layers of camouflage that still can’t disguise the new model’s engine layout. Salesperson Mike Logue discusses the new SmartSlide seating on the all-new 2018 Chevrolet Traverse. It’s easy to use and allows you to move the seat up without having to remove an empty child seat. With the seat moved forward, you have ample access to the third row split bench. If you have any questions or concerns, call Mike Logue or our customer care team at 630-898-9630. If you prefer, visit us online at http://www.WestphalChevy.com. Ron Westphal Chevrolet is a family-owned dealership located in Aurora near Naperville, Plainfield and Oswego.